Perfectly compact, the Denon Envaya Pocket is ready to follow you wherever you go. Built for every day use, the 16cm speaker’s discreet frame means you can take it literally anywhere. The robust polymer and hardwearing fabric construct means it's ready to tackle even the most turbulent of travels, surviving scrapes and tumbles along the way. Even better, the robust construction and IP67 dust and waterproof rating means that there is no terrain it can’t take on. The Ultra -portabel Envaya pocket holds its charge for 10 hours, depending on volume level. Tuned by Denon’s class leading audio engineers, each speaker has been painstakingly crafted to achieve an unmatched musical performance. Simple connectivity and Siri activation allows you hassle free, complete control, from your smartphone. Listen and you will believe that nothing can compensate decades of experience in developing high quality audio products. Denon audio experts and engineers made it possible to get great sound from a speaker smaller than a can of juice. Acoustic knowledge and the capability to design miniature, but high performance amplifiers enables this product to perform at its best in any use. 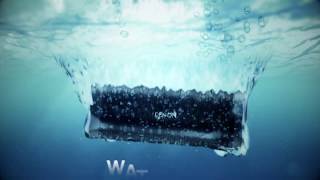 Denon Envaya Pocket is Water and Dust Proof. The official rating is called IP67, which means that the Envaya Pocket can stand in 1m of water for 30 minutes without damage. To achieve this all connectors are covered by a cap, gaps are closed by gaskets and chassis are water resistant which means altogether no water can enter the unit for a certain period.